Very Good condition, steel rifled cannon retrieved from Afghanistan. Note: You get only the barrel, NOT the carriage. Also, your barrel is not painted, but has old steel patina, brownish colored. Barrel has excellent coat of arms. Well-adapted to shooting if you would like to make a carriage and projectiles. 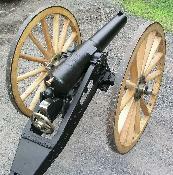 This barrel is shown on an original British carriage owned by a customer, not for sale.